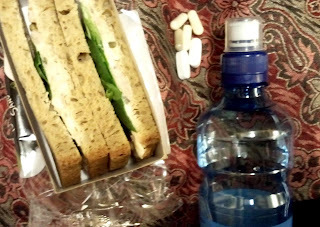 Survival Guide: Dublin with Food Allergies: Judging at the Free From Food Awards 2012! Judging at the Free From Food Awards 2012! sorry for the outrageously RUBBISH photo! Ruth Holroyd from What Allergy? I also met a really great lady who makes Gluten Free Beers (whose name I CAN’T remember!!! -sorry) and some dietitians and authors like Christine Bailey from Advance Nutrition and Tanya Wright, author of ‘Enjoying Life with a Severe Food Allergy’ and ‘I’m Hungry’ who made me laugh many times during the judging (in a good way!). I also met Lesley Cutts from Goodness Direct who was a joy to talk to and judge with. But I suppose you want to know about the judging... Well... I can’t tell you much, at least not until the shortlist comes out in a couple of weeks but there were definitely some exciting products to keep an eye out for in the near future! (Hopefully they will all be available in Ireland in the near future, if not already!) But is was actually a really difficult task. There were new products as well as old faithfuls (that I could recognize despite it being a blind taste test) which only made it more difficult to judge! Everybody obviously has their own taste preferences and agendas be it nutrition, versatility, necessity, etc. so I tried to clear my preconceived opinions on taste and look at each product outside of my own personal likes and dislikes. I found the best way to do this was to taste, taste and taste again because sometimes I find that a first bite can be deceptive... We marked each product out of 10 and made notes with pros and cons which as well as constructive criticism which gets returned to the contestant, and then opened the debate on what we each deemed to be potential Shortlist, Commended and Highly Commended products, and of course, which deserved to be the overall category winner! There were definitely some split camps and some (almost) unanimous decisions but I think the free From world should be happy with the conclusions :) ...I also think that that’s about all I can divulge at present - sorry!! I headed off after the judging, a bit shaky after an onslaught of teatime caffeine and sugar but quite happy that my digestion hadn’t acted up at all ... until .... I got back to the airport with plenty of time to spare and a desperate desire for something savoury. 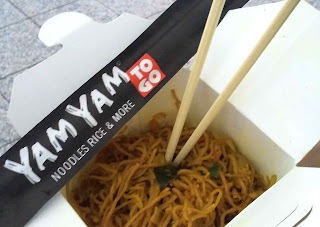 I had a really disappointing, and a bit manky, fast food ‘Singapore Noodles with Shrimp’. It was ridiculously expensive now that I do the conversions, lacked the lustre of rich flavours and despite it being Dairy Free, made my stomach rapidly expand and become quite uncomfortable. Of course, it wasn’t as bad as it could have been but what a disappointment ... but I suppose that’s what I get for eating rubbish fast food especially with a problem digestive system! more apologies for another pathetic photo! In conclusion I have to say that the Judging was a great experience and that I learnt a lot. It was extremely interesting to hear what other people thought about the products which makes me CALL OUT to all my readers yet again to request that you please, please, please share your thoughts and opinions about anything that I review because your opinion is as important as mine!! And also, to always feel free to share your Food Allergy Friendly Finds so we can all try them out! I also discovered and confirmed some pretty strong opinions about allergen free foods, what is needed on the market and how important the titling of your product is! Not to mention the ongoing need for CLEAR allergen and ingredient labelling... How ‘vegetable oil’ or ‘margarine’ aren’t really very helpful ingredient listings, how confusing E numbers can be and how much the Free From community needs manufactures’ help in CLEARLY explaining the Food Allergy risks by realistic warnings deciphering ‘may contain’ warnings between ‘in a factory’ and ‘on a line’, etc. So thats it, until the Shortlist is released, of course! !